Our adventure to explore the small towns and hidden ranches of Baja California Sur covered over 950 miles. Hiking and hitching rides with 25 different vehicles, Margaret and I experienced some of the most interesting topography and encountered the present secrets of Cortez, the friendliness, smiles and hearts of gold that exist today in this region. We drove to LAX and took an Aero California two-hour, non-stop flight to Loreto. After clearing customs, we were met by Trudi Angell, owner of Paddling South, who took us to the Oasis Hotel overlooking tropical gardens, a palm-lined beach and the Sea of Cortez. After checking into our spacious room we joined Trudi at an orientation for her Kayak group in the hotel's festively decorated lounge. Later we took a short walk to one of Trudi's favorite restaurants Sofia’s Canipole Restaurant which is next to the church. Waiter and assistant chef Rubin greeted us with a smile and gave us a tour of this original colonial home decorated with flowers, unique handicrafts and memorabilia. Patio tables overlook the church steeple, outdoor grill and a wishing well. The home-cooked meal and friendly atmosphere would have us return to Loreto anytime. Anxious to begin our Baja adventure, we got up early to head 80 miles north to Mulege. Intending to just go for the day we left our main back packs at the Oasis Hotel. As we headed out to hitch our first ride to Mulege, for curiosity sake, we went to the bus station to get the departure times and prices to Mulege. The response was 90 pesos each or $9 US leaving at 11 a.m. and 1 p.m. Hitch hiking for us is not about money, it’s our way to meet the locals and experience everything from pickups to sophisticated four-wheel drive vehicles. Margaret and I usually travel with a mascot, a colorful talking parrot purchased at the Endangered Species Store in San Francisco. Our talking parrot mascot accompanies us on each adventure, bringing smiles and laughter to those who befriend us - especially local children. 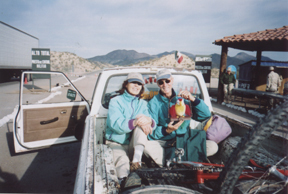 Now, picture two 62-year old gringos with a parrot hitching a ride to Mulege. After just four vehicles passed, bingo our first ride. We climbed in the back of the pickup that, coincidentally, had a mountain bike made in Marin County where we live. Since central Baja is dry and arid the temperature of our journey this day and throughout the trip was 70-85 degrees during the day, and 35-42 degrees from sunset to sunrise. 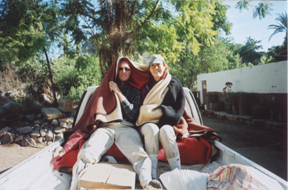 Two chilly hours later we arrived in Mulege and gave the driver and his family some chocolate and $10 US. Most of our longer rides refused to accept any form of payment until we explained it was our contribution for the gasoline. 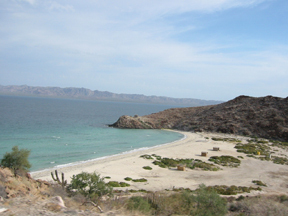 Mulege, founded in 1812, is a laid back, small colonial town without high rises, McDonalds or Pizza Hut. It's located at the mouth of a river and surrounded by hundreds of date palms that were originally planted by the Jesuit missionaries. The local pigs and chickens are fed these dates which produces a special flavor. Arriving hungry and windblown to the Las Casitas Hotel we asked owner Javier Aguiar Zuniga where to have lunch... and, of course he suggested his restaurant. After two scallop cocktails served with freshly made tortillas chips and Tecate beer, he told us Mulege's history. The next morning he was driving two hours north to Santa Rosalia to pick up fresh fish and lobster. He asked if we’d like a ride. The unanimous answer was "Si como no!" To stretch our legs, we walked around Mulege's eight square blocks stopping at Danny’s Tacqaria located in front of the Benito Juarez Statue. We tried his shrimp tacos served with four wooden bowls of sauce, each with a different color and flavor. I chatted with a customer who gave us the history of the tacqaria telling us Danny took over the restaurant three years ago after the original owner died. Jokingly, I said I hope not because of the food and we both laughed out of control for about a minute. What a great way to express the inner child for the older Mexican man and myself. From Danny’s we walked about a mile on a dirt road along the river leading to the Sea of Cortez where egrets and pelicans were enjoying the fresh water fish. We were lucky enough to spot a sea eagle eating a fish on the top of a date tree. Close to the sea, we noticed the three story pink colored Brisa del Mar Hotel managed by Sheryl Bean, who introduced us to Luis Aguiar Cesena, the owner. After showing us the hotel Luis invited us to be his guest for the night. The hotel has a rooftop restaurant and bar with a bird’s eye view of the sea, town and surrounding mountains. No need for alarm clocks in small towns in Baja since the local roosters generally begin crowing at 6 a.m. After breakfast, we connected with Javier for our ride north to Santa Rosalia. The main and only road to Santa Rosalia darts in and out of the coastal mountains, with views of the in Sea of Cortez and small fishing villages lined with North American campers who love to fish and kayak. Santa Rosalia, which is twice the size of Mulege, was established and developed by a French mining company that was given permission to mine copper, if they would build a church, hospital and homes for the workers. Today, the prevalent architecture is still French colonial and the church designed by Eiffel and brought by ship from France, still remains the dominant structure. While Javier did his shopping, Margaret and I walked to the main plaza were we heard some Mexican music being played over loud speakers. Since we love to dance, we took off our jackets and danced to several songs. To our surprise the locals gave us a round of applause and some great smiles. The purpose of the music was to get attention to a raffle and prize of a new 4-wheel drive vehicle. I purchased a ticket and later gave it to Javier for giving us a lift. Once back in Mulege we met Salvador Castro Drew, the owner and guide of Mulege Tours, who gave us a tour of the famous “Prison without Doors” which overlooks the small town. This prison was opened in 1906 and closed in 1972, and because of its remoteness and impossibility to escape, except by boat, they allowed prisoners to work in town and return when a conk shell was blown at sunset. The prison today is a museum funded by the San Diego Historical Society. Our next stop was the Mulege Mission that will celebrate its 300 anniversary in 2005. Salvador then took us along the south bank of the Mulege River, where we met Lena and Kristian Perchmann who recently moved to Mulege to manage their four room first class Casa Granada bed and breakfast. 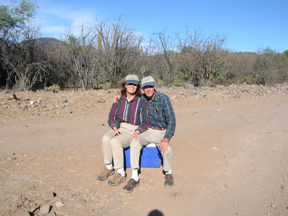 Next we were taken to Hotel Serenidad, the largest hotel in Mulege, owned and managed by Don and Nancy Johnson. The hotel has a landing strip and is famous for their Saturday Pig Roast Party with live entertainment. People from California, Texas and Mexico fly in to enjoy this festive and romantic setting. That evening we stayed and had dinner at the Las Casitas Hotel. We had a table next to the fireplace and listened to the live group that plays there on weekends and holidays. After waking at 7 a.m. to the songs of local sparrows, we decided to do what we thought could be a great day trip to Ruins of Guadalupe. According to our map, we could travel by dirt road inland and do a circular route to the ruins and then pass through the small town of San Jose de Magdelena and eventually take the main highway back to Mulege. Knowing our luck at hitchhiking we left with only a few chocolates and a water bottle. As we asked for directions to the road that led to the Ruins of Guadalupe half the people never heard of it; those that did invariably asked how we planned to get there. To their amazement our answer was “by foot and hitchhiking”. As we began our journey along on the dirt road, we observed every home had an abandoned old 50’s or 60’s car or truck in the front yard, probably due to the high cost of parts plus no way to tow them to the non-existent recycle junkyard. Every car and truck going our way stopped to offer a lift but all were just going a short distance. After hiking about 3 miles on the dirt road and no traffic in either direction, a pickup stopped and asked where we were heading. We immediately asked, “where are you going?” Leonardo Drew, the pickup's driver, replied Rancho Ano Nuevo .And we answered "that’s where we’re going". he lit up a great smile and said vamonos. Since he was heading in the same direction as our estimated route we climbed aboard. Five miles down the dirt road, Leonardo turned right and I thought to myself, "well we may not get to the ruins today, but let’s go with the flow." Our first surprise of the day came when we passed three ostriches among the cactus and the second was meeting his wife, Maria Ester, who, after we helped unload the weekly food supply, served us coffee and took us on a tour of her museum. Margaret and I both agreed that even if we never see the ruins, this day would have been complete just visiting Maria's private collection of coins, stamps and photos plus memorabilia from her grandmother. By coincidence, Salvadore’s mother lives on the ranch. So here we are five miles off course from the dirt road to our destination. Margaret then took out a pair of earrings and gave them to Maria Ester for her hospitality. We always take small gifts to give people we like or who help us. As we said goodbye, Leonardo asked if we’d like a ride back to the main dirt road. What a blessing since we knew that the walk would take at least an hour. After he left us on the main dirt road to the ruins, we walked about eight miles without seeing anything moving except the buzzards circling overhead. Suddenly a pickup laiden with people and supplies and going our way stopped. They would have taken us, but there wasn’t enough room. No problem, so we continued walking for another 3 miles when up ahead I noticed a blue scotch cooler in the center of the road and several bags of food spread all over the place. We collected onions, raw chicken, ice and butter and neatly packed them into the cooler. Now we had two options. The first was to hide the loot from the buzzards and walk back to Rancho Ano Nuevo to share our find with Leonardo and Maria Ester or sit on the cooler to rest our tired legs while waiting for the pickup that lost it to return. Either way we needed to take a break so we moved the cooler to a shady spot for our midday siesta and waited to see what would happen. Thirty minutes later we saw a cloud of dust coming which turned out to be the pickup that couldn’t take us earlier. Now both laughing and crying with joy, they gladly made room and off we went. The food was for their relatives located on a remote ranch 60 miles down the road. Sections of the road became so steep that we had to get out and help push. Guillermo Villavcencio, our savior and driver, by coincidence, works for Agro Productos de Cabo based in Pescadero, California. He and his family were traveling in another direction and had to leave us at a crossroad. He gave us the name of Antonio Aguilar, a friend, who’s ranch San Estanislao was four miles away on a road to the ruins.It was now about two hours before dark, so I asked Guillermo if he could spare some matches to make a fire, just in case we couldn’t make it to Antonio’s ranch before dark. The beauty of the desert and surrounding mesa like mountains plus the silence gave us the energy and speed to arrive to the ranch at dusk. During the hike we talked about how unique it would be to have to sleep on the road next to a campfire made with dry cactus if no one was at the ranch. Rosa, Antonio’s wife greeted us with a golden smile and after we explained our days adventure immediately offered us some coffee and a bed for the night. She said that Antonio was working in their garlic garden and would return soon. It was now getting dark and cold, so Margaret and I collected some wood for the kitchen’s fireplace. Once Antonio arrived, Rosa prepared tamales, homemade goat cheese and crackers plus more coffee. It seemed like a royal feast after hiking about 20 miles through the backcountry of Baja Sur. By sheer luck their son arrived by truck with their holiday supplies plus our favorite Tecate beer perfectly chilled by the evening temperature. The air temperature, as we sat as close to the fire as possible, in the open-air thatched roof kitchen, was about 42 degrees and getting cooler every hour. After dinner their son had to leave to go to another ranch to take care of a friends herd of goats. That night we slept with two wool blankets and fully dressed to rest up for the next day’s continuation of what was supposed to be a one-day trip. The ranches in this region, which can easily be 10-15 miles apart, have no electricity, phone or TV and communicate to one another by short wave radio. The 6 a.m. rooster was right on time, so we got up and stoked the fire as Rosa prepared coffee and fried eggs. We waited till about 8 a.m. for the sun to rise over the canyon to warm the air. When we thanked Rosa and Antonio for their hospitality they told us to look for Dianna who takes care of the ranch next to the Ruins of Guadalupe. Rested and charged from a deep sleep and great breakfast, we’re off to see the ruins 15 miles down the road. During the next 3 hours with no traffic in sight we passed by the goat farm where we met up with Antonio, Rosa’s son who greeted us with a smile and gave us a tour of his friend’s goat farm. After a few photos, we continued our adventure walking through several canyons and noticed that the few cows in this area were delicately eating the freshest buds of cactus without thorns. We both smiled, wondering what their milk would taste like. After five hours of walking with not one vehicle in sight, we finally saw an oasis of date palms which turned out to be next to Dianna’s house and the “famous” ruins. Dianna and her two children, plus their barking chihuahua, greeted us with a smile. She immediately asked if our car had broken down. We laughed and said, no "we walked from Rosa’s." As we sat on the porch of her thatched roof house, overlooking the date palms and surrounding mesa mountains, her 3-year-old son demonstrated his skill at riding his 2-wheel bicycle around the house. The son and daughter asked if we’d like to see the ruins. Finally we’re going to see the famous ruins. They took us just 50 yards to a small chapel which had the original wooden statue of Virgin Mary with about 100 candles in gars in front of it plus some wooden benches. The actual ruins, next to the chapel, were exactly that, just a few piles of stones where the original walls stood. It’s now about 4 p.m. and our legs were ready to roll again. So off we go on the road to San Jose de Magdalena just 18 miles down the road. We knew we could always double back and spend the night at Dianna’s if we didn’t get a lift, plus Dianna said they were driving to San Jose de Magdelena at dawn the next day. After hiking one hour we heard whistling. I said to Margaret it’s not a bird and then around the bend came a 90 year old Don Quijote looking man called Jaspor riding a mule with another mule tied behind him. He greeted us with another golden smile and asked if we needed any water. "Sure," we said and he poured some into our plastic container. We asked him if there were some caves along the road ahead where we could spend the night? He proceeded to give us specific directions and bid us farewell. He had just come from San Jose de Magdelena to work on his farm located high in the mountains. We’ll never forget his cheerful attitude plus hearing his whistling as he and his mules disappeared in the distance. Margaret and I then made a commitment that we would walk until we reached the next ranch or sleep in a cave with Indian paintings. Just as it began to get dark, we heard a dog barking and knew a ranch house was close. Sure enough, down the road was a trail leading to a ranch. We quickened our pace to arrive before dark and realized our overnight cave experience would have to wait. As we opened the gate we saw Nieve standing over an open fire, boiling milk to make cheese. She greeted us with a smile and also asked if our car had broken down. Watching her making the cheese and getting the warmth from the fire couldn’t have been a greater reward for a day of walking in this remote, picturesque part of the world. Her husband, Francisco arrived shortly after with a pickup full of mesquite that he collects, chops and splits to sell to a bakery in Santa Rosalia. His major source of income for the last 25 years. Margaret and I were happy that night to sleep in a warm bed verses a cold cave or along the dirt road. Their ranch house had no electricity, phone, TV or refrigerator, but was full of love for one another. The next morning, knowing that Dianna and her family would be driving past on their way to visit relatives in San Jose de Magdelena about sunrise, we asked Nieve if we could hear the pickup far enough away to meet it at the main road. She replied don’t worry we can hear it coming a mile away. A few minutes later she jumped up and said, “Here it comes” and began running to open the gate for us. It was like a Chinese fire drill, trying to not miss our only possible ride to San Jose de Magdelena. Since we had told Dianna we would be on the road, if we were just seconds later they would have passed and we would have to walk for another 18 miles to reach San Jose de Magdelena. Since we had to ride in the open air, Dianna asked if we’d like to use some wool blankets stored in the back of the pickup. We gladly accepted the offer since the wind chill factor at that time of morning was about 35 degrees traveling at 50 mph. Half an hour later we arrived at San Jose de Magdelena, a small agricultural town with dirt streets surrounded by date palms. Luckily for us, Dianna and her family were eventually going to Mulege, but had to visit relatives in San Jose first. Margaret and I were happy to stretch our legs and received more great smiles and hot coffee. Just outside their relative’s house I spotted some very healthy looking nestersha plants and immediately picked some to eat since we hadn’t eaten anything green for the last 2 days. Everyone watched with amazement and said they didn’t know you could eat them. As of that day if you visit San Jose de Magdelena you’ll probably find a little nasturtium in the tamales or other dishes. One lady from the town was so grateful for sharing this discovery, she brought us a bag full of tamales as a reward. Since we knew Dianna would have to spend time with her relatives, we decided to walk and told Dianna to look for us along the road. As we walked out of town we passed the cemetery. Its well kept pastel colored shrines reflected the love these people have for their ancestors. Next we passed two men making a roof with the local date palms who smiled and responded “como no” (of course) to our photo request. After walking for an hour, Marco Cesena in his pickup stopped to give us a lift. He invited us to get inside, but our choice was to stand up behind the cabin and enjoy the breathtaking views as the temperature now was about 70 degrees and the possibility of dust from oncoming traffic was nil. An hour later, Marco parked off the road and asked if we’d like to see an old copper mine. " Sure," we said and followed him about 100 yards to the entrance to the mine. He said that the mine was abandoned when water entered the mines and made working it impossible. Soon after we arrived to the paved Route 1 where Marco let us off since he had to go north to Santa Rosalia. Now we had lots of traffic compared with none the last two days, however, there was no shoulder for anyone to pull off to give us a lift. So we walked about half a mile to reach a shoulder wide enough to get a lift. As we waited a late model Toyota Sienna, our first ride in anything less than 30 years old, stopped across the highway and asked if we were okay. We smiled and said we’re fine. Jeromy and his family then pulled into the shoulder and gave us a lift. They were from Alameda, California. He asked if we’d like to join them for a fish BBQ on a deserted beach. We regretfully had to decline since our goal was to reach Mulege, retrieve our daypacks and head for Loreto. A few miles later they dropped us off where they had to turn toward the Sea of Cortez. Shortly along came Dianna, our savior, who took us right to the front door of the Las Casitas Hotel. We quickly went to the front desk, grabbed the famous taking parrot and gave it to her children. Javier, the owner, was glad to see us since we told him we’d be back from our day trip to Ruins de Guadalupe two days ago. Anxious to reach Loreto for a hot shower and change of clothes, we walked from the hotel to Route 1 for our fifth ride of the day. Sure enough 3 vehicles passed and the fourth stopped giving us a 2 hour ride all the way to Loreto. The driver, en route to La Paz, dropped us about two miles from our hotel. Margaret suggested we walk to the hotel, but only two cars later four lively high school students stopped and drove us to the Oasis Hotel where we'd left our main backpacks three days ago. After a long hot shower, we met with Pascal Pellegrino, the hotel’s consultant, who offered us a room at his Casa de Ana cabins located at our next days destination, San Javier. This town about 40 miles inland from Loreto has only one place to stay and that’s at his 4 room colonial style cabins, facing the famous Mission of San Javier. Pascal, in exchange for the night's stay, wanted us to locate the hidden quarry where the missionaries got the stones to make this well preserved church. That night we had a great fish dinner at Mita Gourmet Restaurant, owned and managed by Juan Carlos and Martha Cortez. 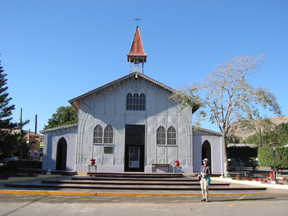 It's located just across the plaza from the museum and the government building of Loreto. After two breakfasts at the ranches in the interior, we really appreciated ordering anything we desired while sitting in the Oasis Hotel dining room overlooking the Sea of Cortez. Trudi of Paddling South had told us she had to take some mountain bikes to a ranch near San Javier, our next destination. After breakfast we splurged by taking a taxi with our two full backpacks to meet Trudi at her house. She greeted us with another Baja smile and graciously offered to keep our two large packs at her house. Since we knew we were only going for one night, we just took our day pack with a few essentials. An hour later, traveling with Trudi on a scenic dirt road, we arrived at her destination, the ranch where she kept her mules. That day she was expecting two groups. One group that would do a mountain bike adventure and another that would take a mule trip. We thanked Trudi for the lift and were off again to San Javier 15 miles further. After walking for only an hour Don and Marian drove by in their new Land Rover. We had spoken to them at breakfast about our plan to visit San Javier and decided to go there as well. Lucky for us since it was another 10 miles to San Javier. Once we arrived at San Javier we checked into the Casa de Ana and immediately went to the famous Mission de San Javier, noted for being the most well-preserved mission in Baja. As we left the mission we heard the sound of motorcycles riden by three colorfully-dressed dirt bikers from Idaho. Their space-like protective clothing and helmets drew the attention of everyone in the village, especially the children. Since we had promised Pascal of the Oasis Hotel that we’d try to locate the quarry where the stones to make the church came from, we asked a few locals who said it would take about three hours to hike to the quarry. About 4 p.m. we walked in the direction they had indicated . Along the way we met an elderly – to us elderly is over 80 – couple who were going to Mass at the Mission de San Javier. By sheer luck, they said the trail to the quarry was just to the right from where we stood. This made our day. Next we needed to find the person who could lead us to the quarry. There happened to be a lagoon between where we stood and the trail, so we continued walking to find a place to cross the lagoon. We then walked to a ranch house where the trail began, greeted by smiling Victor and his family. After explaining our purpose to find the quarry, they said their son Pablo could take us tomorrow and arranged an 8 a.m. rendezvous with him on the next day. Victor, the father of the family, was eating a lemon the size of a grapefruit. He asked if we’d like to try each of the four varieties growing in the front yard. We never say "no" to fresh fruit. This was the first lemon tasting we'd ever experienced and each had a different size, color and taste. We broke out the chocolates and offered them an exchange. 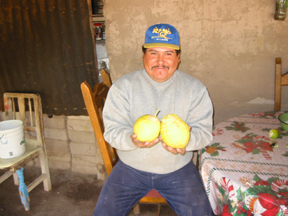 Victor Manual Osuna Romero, the father, then gave us a bag of our favorites, the Royal lemons. Walking back to the village of San Javier, a pick-up stopped and gave us a lift. The ride enabled us to arrive back in town before dark. By this time we were famished so we went to the only restaurant in the village where we met the only other foreigners in town. They asked if we’d like to join them for the sole menu items – beans, rice and tamales and, luckily, some Tecate beer. After dinner we headed straight for the Casa de Ana cabin for 12-hours of well-deserved sleep. When the temperature dropped to about 40°F, I lit two candles for a romantic atmosphere and a bit of warmth. As we settled into bed we wondered if the town’s generator, located only 100 yards away which operates from 7 to 10 p.m., would keep us awake. We didn’t hear a sound! The next morning we gave the remaining Royal lemons, which actually taste like oranges, to the couple in the cabin next to ours and with whom we had shared Christmas dinner. Once the sun came up over the surrounding mesa-like mountains, we walked about two miles to meet up with Pablo. We arrived at the ranch where the entire family greeted us with smiles, fresh orange juice and hot coffee. With Pablo as our guide, we began our steep uphill climb on a narrow trail lined with cacti and a sundry spiny trees and plants. The loose gravel and rocks on the trail turned what we thought would be an easy half hour climb to the top into almost two hours. Close to the top Pablo asked if we’d like to see a cave with some Indian markings. Our unanimous reply was “Si como no.” A few minutes later we arrived at the cave. Sure enough, we got to see the markings. As if that wasn’t enough, Margaret and I started digging in the powdery soil to see if we could find some relics. To our surprise the only things we found were some petrified clamshells. Once atop this expansive mesa, we felt as though we'd discovered another planet. After about 200 yards, Pablo led us to the secret quarry where we could see remnants of the stones used to build Mission of San Javier. After seeing the quarry, which now was covered by cacti and thorny trees, we decided to take advantage of being in this other world by walking toward another pile of boulders. Each rock must have easily weighed several tons. I climbed to the top to experience the energy it must have taken to neatly stack them. Another unique sight was an ancient riverbed of pure rocks which didn’t permit any plant life to grow between them. Regretfully, we had to begin our descent, which actually took longer than the assent due to the loose gravel. We now were able to enjoy the spectacular views and see the steeple of the Mission of San Javier about three miles away. Finally, at the bottom of the trail which literally began at their ranch, we gave Pablo $40 for guiding us safely back . As we said goodbye to the family, we paused for a moment to appreciate the hospitality and simple lifestyle the people in this region have compared to the lifestyles of North America. It was 3 p.m. Time to make another major decision: Walk back to San Javier or try our luck hitchhiking a ride in the opposite direction and do a loop through Ciudad Insurgentes and then back to Loreto. This time Margaret was a little reluctant to go the longer 150-mile route versus the 40-mile route, but finally gave in. Just 100 yards from Pablo’s house, we passed by the older couple who had given us the advice on where the trail was. They magically appeared in their front yard and offered us some coffee. Sitting in their front yard sipping coffee with this couple and their dog was like two angels coming into our life and saying stop and enjoy life with us. A brief siesta and coffee was just what we needed after our six-hour climbing adventure. Sitting in the yard we could easily spot or hear any vehicles which seemed to be non-existent. Setting out on the dirt road again, we walked for about an hour until a van stopped to offer a lift. Unfortunately he was only traveling another mile down the road, but we decided one mile less to walk and climbed aboard. The sun began to disappear behind the towering mesas which brought the temperature to about 50°F. No problem, since this time we had our jackets. It’s now close to sunset. We were ready to sit by the road and make a fire. Suddenly we heard an engine about a mile away and could see a dust cloud coming toward us and in the direction we needed to travel. Knowing this could be our only transportation until morning. We either had to stand in the middle of the road so they had to stop or stand on the side of the road and pray they would stop. The dust was coming at about 50 mph, so I quickly stood with Margaret on the side of the road and started praying. Sure enough, they stopped to ask our destination. “Wherever you’re going.” we responded. As luck would have it, they were going all the way to Cuidad Insurgentes where we could get a ride or bus back to Loreto. As we rode in the open air in the back of the pick-up, we both smiled and watched the full moon rise through the cloud of dust. For the next 2 hours we traveled at 50 mph on this narrow dirt road passing only one other vehicle going toward San Javier. Fortunately, we arrived at Ciudad Insurgentes at dusk as getting a ride at night is almost impossible. After just five minutes, a 16-wheeler pulled off the road and signaled us to climb aboard while he finished cleaning his windshield. This was our first semi-truck ride, ever. About 16 tons and 53 feet from bumper to the rear, it felt like riding on an elephant since we sat about 8 feet above the road. The 25-year-old driver in t-shirt and baseball cap turned backwards had delivered several yachts to Cabo San Lucas and was traveling back to Tijuana. About 15 minutes down the road to Loreto he downshifted, which startled me. Hearing the mufflers from a 550 horse-powered diesel engine from inside the cabin was almost deafening but we got used to it. Two hours later, which would have taken only an hour by private care, we arrived in Loreto. We quickly showered and returned to Sofia’s Restaurant for the belated Christmas dinner she had invited us to. After breakfast we decided to forgo hitchhiking and took a taxi to the main highway leading from Loreto to La Paz. Traveling in the daylight we were able to see the secluded beaches and coastal mountains we had missed during our ride in the semi the night before. Almost immediately after we started our morning hitchhiking, along came Marla Daily, an anthropologist, and Kirk Connelly, her partner. They were each driving separate vehicles, so Margaret rode with Kirk and I got in with Marla. Coincidentally Marla was studying the cultural and family connections of the relatives of the ranch families we had encountered during the last four days. Marla and Kirk were heading north and left us off in Ciudad Insurgentes at the main crossroad to La Paz. Not long after, Jorge Mesa, a local farmer, stopped and gave us a half-hour lift to Ciudad Constitution. This part of the highway was perfectly straight, flat and lined with fields of corn, wheat, garbanzo and orange groves. Even though there is little rainfall, water for irrigation is supplied by local wells. Jorge was going as far as Constitution so he let us out in front of El Cayuco Jr. Restaurant. The bamboo walls, thatched roof and menu including every variety of seafood imaginable, plus the fact that nearly all the tables were already full at 11:30 a.m., lured us to a great meal. We started with a jumbo shrimp cocktail, which was nearly a full meal, followed by fish soup and Zarandead – a fish filet wrapped in foil with herbs and cooked on an open mesquite grill, which is their specialty. After two beers followed by a great flan dessert accompanied by strolling Mariachis, the bill came to only $15 U.S. Don’t ever pass through Constitution without stopping at the El Cayuco Jr. Restaurant and meeting Ernesto Cervantes who speaks English and his partner Gerardo Alaniz. The restaurant is open from 11 a.m.to 8 p.m. daily, except Tuesday. It is located next to the gas station across from Taller Calo. After our great lunch, we’re ready for our next ride with an ex-truck driver who was returning from visiting relatives in Constitution and driving to La Paz. He had to quit driving trucks due to poor vision and asked if we’d mind if he drove slowly. Margaret and I thought what a kind man and traveling 40 mph seemed just fine. He left us out on the outskirts of La Paz. Here we hopped a local mini bus costing a mere 10 pesos, or about 10 cents U.S. It dropped us just six blocks from our next stop, the Nuevo Peking Hotel managed by Chu Hung Ying. Yes, you guessed it, it had a great Chinese restaurant and very spacious rooms. It’s located on the oceanfront promenade where most of the restaurants and nightlife are located. We decided to try La Fonda, a local restaurant several people had recommended. Owners Jorge and Silvia greeted us with more great smiles and cooked up some of their favorite homemade dishes. They’re open daily from 7 a.m. – 11 p.m. on Revolucion at the corner of Bravo and Ocampo. Since we were their last customers, Jorge sat with us and told us the story of their restaurant. The great food and friendly atmosphere would have us return two days later to try their famous cactus salad. On our way to our hotel, just two blocks from the La Fonda, we stopped to check out the Casa Tuscany Inn, a unique bed and breakfast owned and managed by Patricia Lowe. Whenever we return to La Paz, we will definitely stay there. Today’s our day to finally take a day trip to snorkel, kayak and enjoy the local sea life with Baja Expeditions. Owner Tim Means arranged transportation from our hotel to the dock where we were given an orientation on safety features plus an explanation of the day’s itinerary. The experience that day plus the great onboard lunch was one of the highlights of our Baja adventure. We left the dock at about 9 a.m. and returned at sunset. Check out their website, BajaExpeditions.com, as well as all the other websites on the last page of this article. The last full day of our adventure, we decided to visit El Triunfo and Todos Santos. Carlos Means, our guide from Baja Expeditions, gave us some tips plus a hand-drawn map which led to both towns. Yes, we could have relaxed and enjoyed the sights of La Paz, but of course not to disappoint anyone reading this far, we had an early breakfast overlooking the Sea of Cortez and palm trees at the La Terrazo Restaurant. After breakfast we met Ramon and Josefina Almada, professors at the La Paz University, who kindly drove us to the outskirts of La Paz. We spotted a bus going our way and climbed aboard. Fifty pesos, or $5 U.S., seemed very reasonable to travel two hours to Todos Santos. Once in Todos Santos on the Pacific Ocean, we got our second ride of the day, who dropped us at a dirt road leading to the ocean. We decided to walk to the ocean on a nearby dried-up streambed lined with aloe vera plants and cactus. It's a given that all streams flow into the sea and usually end up at a beach. Almost there we spotted two women’s heads among the cactus. My first thought was, “Oops, they may be doing a little potty off the dirt road which paralleled the stream.” Well, it turns out they were both professional artists with their easels. Marsha and Margaret have an art gallery specializing in desert art in Todos Santos. We finally arrived at the beach of Punto Lobo, a half-mile beach with some fishermen and a few friendly pelicans. Knowing time was short for our trip to El Triunfo, we hitched a ride back to Todos Santos with the fisherman. In Todos Santos, we had lunch at Miguel’s Restaurant which is in front of the only gas station in town. Miguel, after serving us a great jumbo shrimp relleno and our favorite Tecate, proudly showed us a page of the December 15th New York Times that had an article about his restaurant. After lunch we’re on the road again, trying our luck at getting a ride back toward La Paz to visit El Triunfo. With no luck after 10 minutes, which seemed a long time since there was lots of traffic, a van with 18 rice workers stopped to give us a lift. It was packed like sardines, but they all shifted and gave us two buckets to sit on. During this trip we learned first-hand why so many people from Mexico are migrating to the promised land - Norte America. They get up at 4 a.m. to get the company’s transportation, drive for one hour, work in the rice fields and factory for eight hours and return to their homes at 3 p.m. for a grand total of $10 each per day. Once they let us out we caught a public bus to El Triunfo. This small four-block square town, once a thriving gold and silver mining town, has almost become a ghost town except for the general store, church and museum of pianos. We took a bus back to La Paz late in the afternoon, and that evening went back to La Fonda Restaurant to try their famous cactus salad. Our morning flight from La Paz with Aero Californio quickly took us back to the reality we had almost forgotten. As we drove to our home in Fairfax, California, we flashed back to our tranquil days and the simple lifestyle plus the Secrets of Cortez that we’ll always remember. John Benus, a resident of Northern California for 20 years, graduated from Michigan State University with a degree in Hotel & Restaurant Management. His passion and mission in life is to create a better world and more fun for everyone. People often refer to him as the "Fun Doctor". As the Director of the Venezuelan Tourism Association (VTA), he not only promotes and leads trips to Venezuela, but also is the author of the Travel Planner for Venezuela. John decided to utilize his 25 years of exploring Venezuela by leading soft adventures to Angel Falls, world's highest waterfall, the tropical Andes with the world's longest and highest tramway, up to 15,000 ft. plus bird watching and wildlife adventures in Venezuela. In between his travels to and within Venezuela, John edits & publishes the world's first and only Color Coded Maps & What's Happening Calendars of major cities of California. John's love for nature and his concern for improving our environment, motivated him to become the founder & director of the Environmental Care Organization (ECO) which organizes campaigns to educate people to respect, maintain and preserve our natural wonders and wildlife. For the last 2 years, John has been organizing and leading full moon hikes and events for the Marin Moonshiners. To keep his head clear, John religiously takes time out to hike and bushwhack in the National Parks close to his home. Visit John's website Venezuelan Tours. Listen to John's interview on Talking Travel.